Prime Minister Narendra Modi approved a proposal to set up a committee which will lay down standards for India’s metro rail systems. The decision aims at cutting the costs in the construction and operation of metro rail systems in the country and brings them under the Make in India. 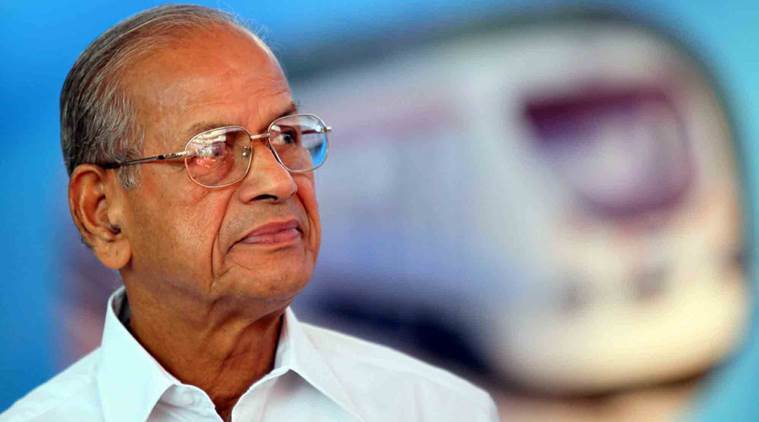 The committee will be headed by E Sreedharan, a retired Indian Engineering Service (IES) officer who is also popularly known as the “Metro Man”. Instead of evolving standards for each component separately, the committee will go into all aspects and then come up with uniform standards for various components that will be followed by metro rail systems across the country. It will bring India to the international standard in line with Russia and Eastern Europe where every metro has the same standards, the same signalling system and track gauge, etc. E Sreedharan, popularly known as the Metro Man, will head the committee that will lay down standards for India’s metro rail systems. RemoveDEBRIS is the first satellite that was successfully deployed from International Space Station (ISS) and to demonstrate a range of innovative technologies to clean up space debris orbiting Earth. It was transported to ISS via SpaceX CRS-14 launch in early April 2018. RemoveDEBRIS mission is aimed at performing key Active Debris Removal (ADR) technology demonstrations representative of operational scenario during low-cost mission using novel key technologies for ADR. The satellite was designed, built and manufactured by consortium of space companies and research institutions led by Surrey Space Centre at University of Surrey, United Kingdom. The project is co-funded by European Commission. Under the Van Dhan Scheme of the Ministry of Tribal Affairs, the Government proposes to set up 3000 Van Dhan Kendras involving 30,000 Self Help Groups (SHGs) across the country. The Prime Minister launched the Van Dhan Scheme of Ministry of Tribal Affairs and Tribal Cooperative Marketing Development Federation of India (TRIFED) on 14th April, 2018 during the celebrations of Ambedkar Jayanti at Bijapur Chattisgarh. Van Dhan Mission is an initiative for targeting livelihood generation for tribals by harnessing non-timber forest produces, the true wealth of forest i.e. Van Dhan with an estimated value: Rs.2 Lakh Cr. per year. According to recent report by the McKinsey Global Institute (MGI) for the Asia-Pacific region, India scored 0.30 in gender equality at work and 0.78 in legal protection and political voice. It is behind Asia-Pacific average in all four categories of GPS, but ahead of Bangladesh and Pakistan. The report had assessed inequality on the basis of Gender Parity Score (GPS) that uses 15 indicators of gender equality in work and society under four broad categories. It ranks countries on scale of 0 (signifying inequality) to 1 (signifying parity).Advancing womens equality in India will add $770 billion in 2025 over and above its business-as-usual GDP. Credit rating model, a new system that will assist banks in assessing credit risk and probability of fraud using big data analysis is being tested by Ministry of Electronics and Information Technology (MeitY). The system is expected to help banks, particularly rural and cooperative banks, tackle the issue of rising nonperforming assets (NPAs). Currently, rural and cooperative banks depend on judgement of bank manager, resulting in high NPAs and frauds. The MeitY sponsored project includes Reserve Bank of India (RBI), Bangalore-based IT firm Processware System and two cooperative banks as partners. The aim of the project is helping banks quantify risks associated with retail loans such as personal loans, gold loans and vehicle loans. India and Seychelles will ensure mutually beneficial steps regarding stalled plans for a military base at the island of Assumption. At the end of a bilateral meeting with visiting Seychelles President Danny Faure at Hyderabad House, New Delhi, Mr. Modi announced several initiatives for the strategically located country that included the grant of a major Line of Credit (LoC) for purchase of defence Both the countries sealed six agreements including one that will twin Panjim in Goa with Victoria of Seychelles. To give greater impetus to mega infrastructure projects, the Asian Infrastructure Investment Bank (AIIB) has approved investment of $200 million in India’s National Investment & Infrastructure Fund (NIIF) to to give greater impetus to mega infrastructure projects. It will be investing US $100 million now and remaining $100 million in the time to come. AIIB, which is China led multilateral development bank set up in 2016, so far approved $4.4 billion investments in 25 projects. Of these investments, $1.2 billion have been approved for six infrastructure projects in India, making it largest recipient of funds from the multilateral agency. Turkish President Recep Tayyip Erdoğan won sweeping new executive powers after his victory in landmark elections that also saw his Islamic-rooted Justice and Development Party (AKP) and its nationalist allies secure a majority in Parliament. The elections were held under the state of emergency imposed shortly after the 2016 coup, in which at least 240 people were killed. Mr. Erdoğan has said he will soon lift the state of emergency. 1. The committee which will lay down standards for India’s metro rail systems will be headed by __? 2. What is the aim of the E Sreedharan panel? 3. Which is the first satellite to clean up space debris orbiting Earth? 4. RemoveDEBRIS was deployed from __? 5. What is Credit rating model? Great initiative, however each news should be more condensed and greater in number.